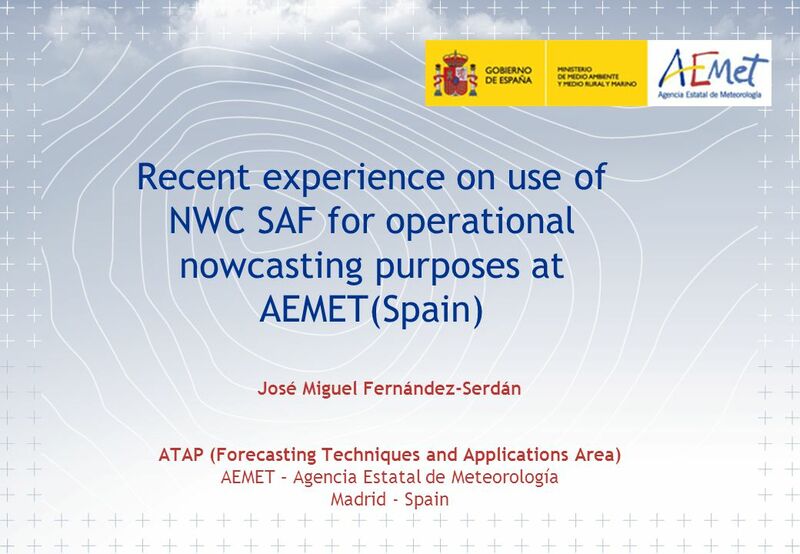 Recent experience on use of NWC SAF for operational nowcasting purposes at AEMET(Spain) José Miguel Fernández-Serdán ATAP (Forecasting Techniques and Applications. 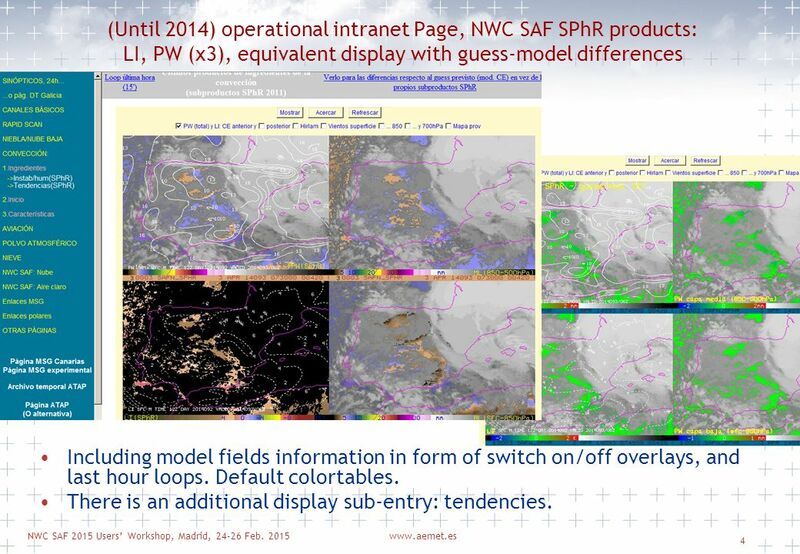 4 NWC SAF 2015 Users’ Workshop, Madrid, 24-26 Feb. 2015www.aemet.es 4 (Until 2014) operational intranet Page, NWC SAF SPhR products: LI, PW (x3), equivalent display with guess-model differences Including model fields information in form of switch on/off overlays, and last hour loops. Default colortables. There is an additional display sub-entry: tendencies. 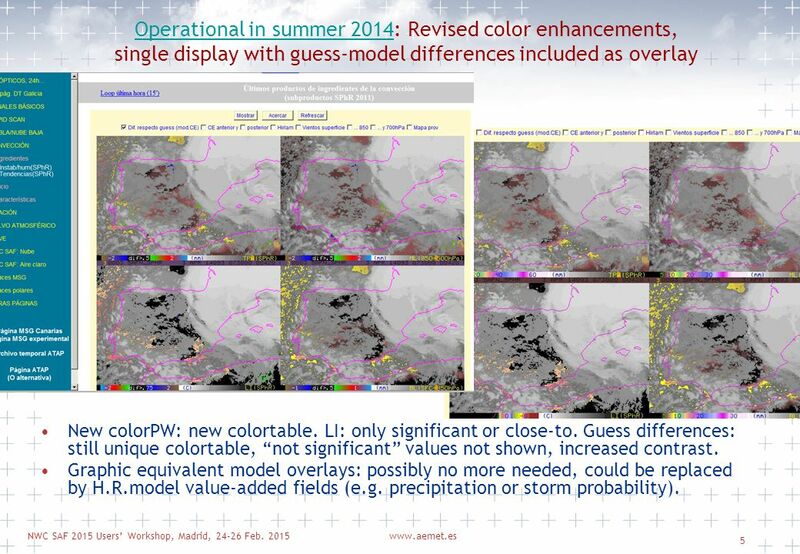 5 NWC SAF 2015 Users’ Workshop, Madrid, 24-26 Feb. 2015www.aemet.es 5 Operational in summer 2014Operational in summer 2014: Revised color enhancements, single display with guess-model differences included as overlay New colorPW: new colortable. LI: only significant or close-to. Guess differences: still unique colortable, “not significant” values not shown, increased contrast. Graphic equivalent model overlays: possibly no more needed, could be replaced by H.R.model value-added fields (e.g. precipitation or storm probability). 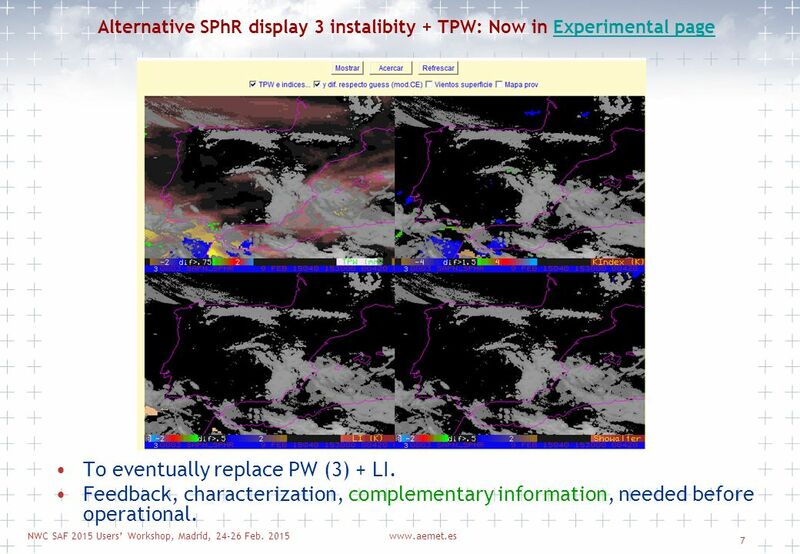 7 NWC SAF 2015 Users’ Workshop, Madrid, 24-26 Feb. 2015www.aemet.es 7 Alternative SPhR display 3 instalibity + TPW: Now in Experimental pageExperimental page To eventually replace PW (3) + LI. Feedback, characterization, complementary information, needed before operational. 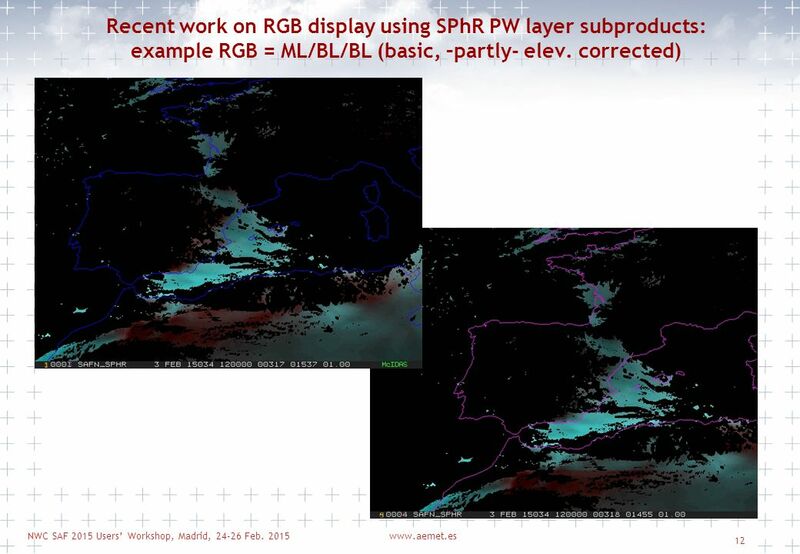 10 NWC SAF 2015 Users’ Workshop, Madrid, 24-26 Feb. 2015www.aemet.es 10 Ideas as complement (I): Recent work on RGB display using SPhR PW layer subproducts, adopted criteria Only BL and ML layers (to increase contrast, reduce colours; HL difficult to use and generally not significant). 2 RGB configurations have been retained (RGB = BL/BL/ML and ML/BL/BL). 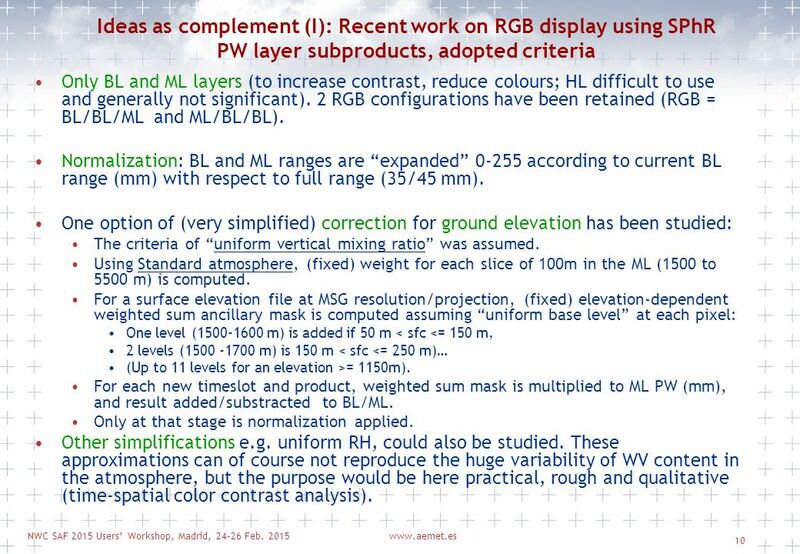 Normalization: BL and ML ranges are “expanded” 0-255 according to current BL range (mm) with respect to full range (35/45 mm). One option of (very simplified) correction for ground elevation has been studied: The criteria of “uniform vertical mixing ratio” was assumed. Using Standard atmosphere, (fixed) weight for each slice of 100m in the ML (1500 to 5500 m) is computed. For a surface elevation file at MSG resolution/projection, (fixed) elevation-dependent weighted sum ancillary mask is computed assuming “uniform base level” at each pixel: One level (1500-1600 m) is added if 50 m < sfc <= 150 m, 2 levels (1500 -1700 m) is 150 m < sfc <= 250 m)… (Up to 11 levels for an elevation >= 1150m). For each new timeslot and product, weighted sum mask is multiplied to ML PW (mm), and result added/substracted to BL/ML. Only at that stage is normalization applied. Other simplifications e.g. uniform RH, could also be studied. 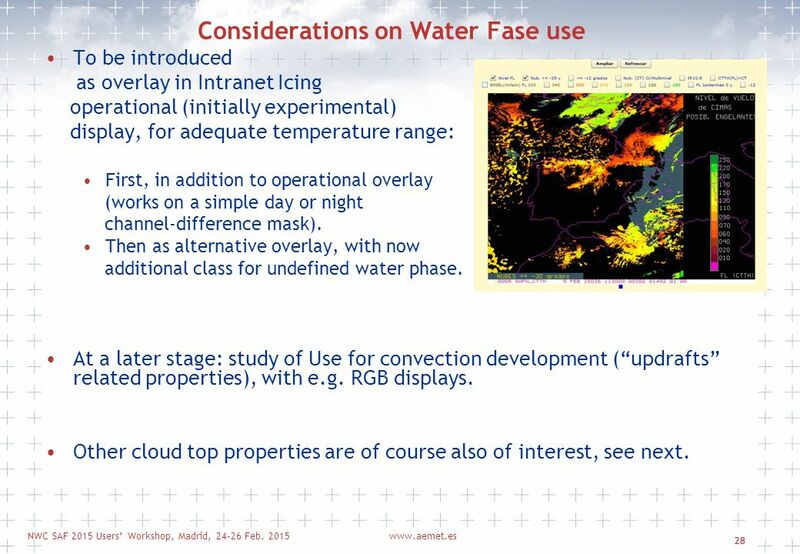 These approximations can of course not reproduce the huge variability of WV content in the atmosphere, but the purpose would be here practical, rough and qualitative (time-spatial color contrast analysis). 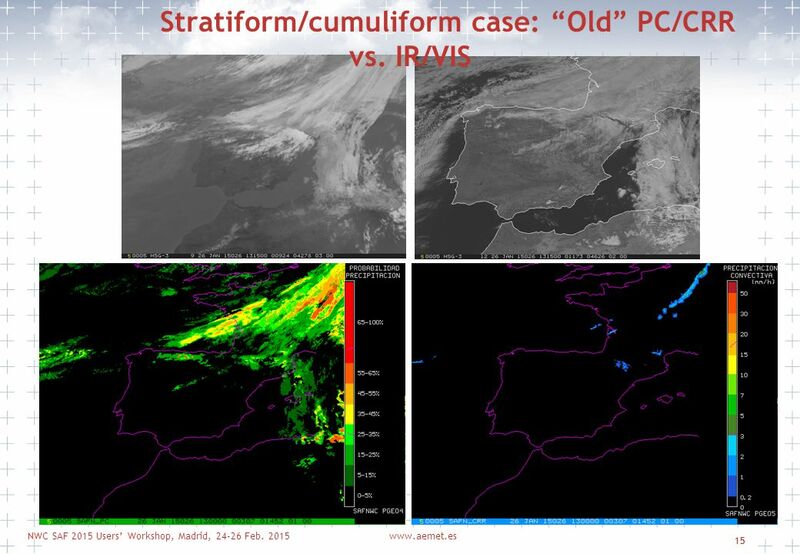 13 NWC SAF 2015 Users’ Workshop, Madrid, 24-26 Feb. 2015www.aemet.es 13 Display of subproduct Tendencies: diurnal evolution of LI instability with respect to mean of last few days or climatology. 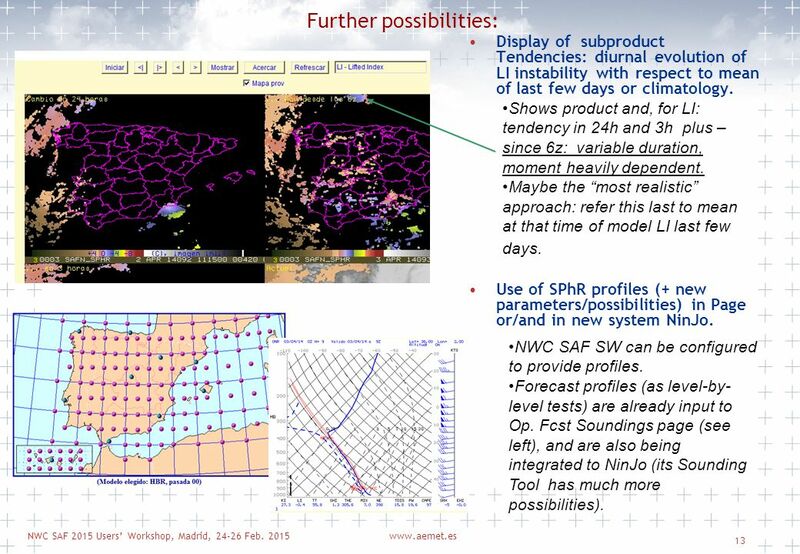 Use of SPhR profiles (+ new parameters/possibilities) in Page or/and in new system NinJo. Further possibilities: Shows product and, for LI: tendency in 24h and 3h plus – since 6z: variable duration, moment heavily dependent. Maybe the “most realistic” approach: refer this last to mean at that time of model LI last few days. NWC SAF SW can be configured to provide profiles. Forecast profiles (as level-by- level tests) are already input to Op. Fcst Soundings page (see left), and are also being integrated to NinJo (its Sounding Tool has much more possibilities). 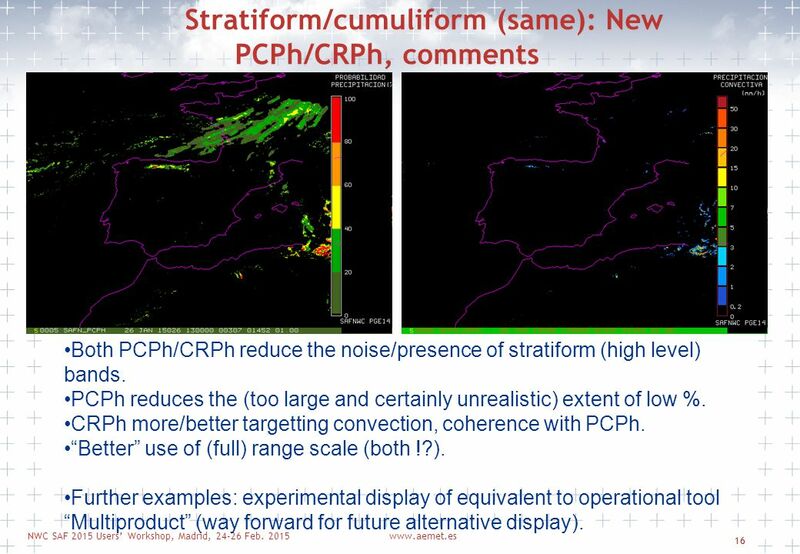 16 NWC SAF 2015 Users’ Workshop, Madrid, 24-26 Feb. 2015www.aemet.es 16 Stratiform/cumuliform (same): New PCPh/CRPh, comments Both PCPh/CRPh reduce the noise/presence of stratiform (high level) bands. PCPh reduces the (too large and certainly unrealistic) extent of low %. 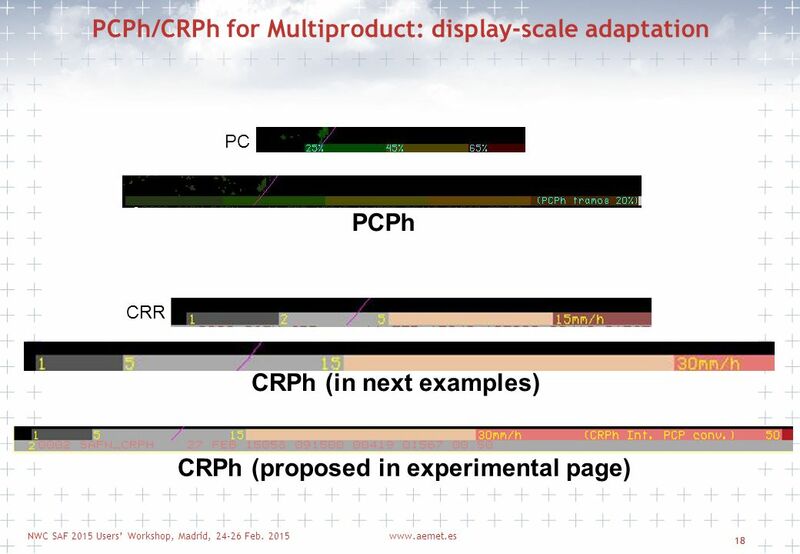 CRPh more/better targetting convection, coherence with PCPh. “Better” use of (full) range scale (both !?). Further examples: experimental display of equivalent to operational tool “Multiproduct” (way forward for future alternative display). 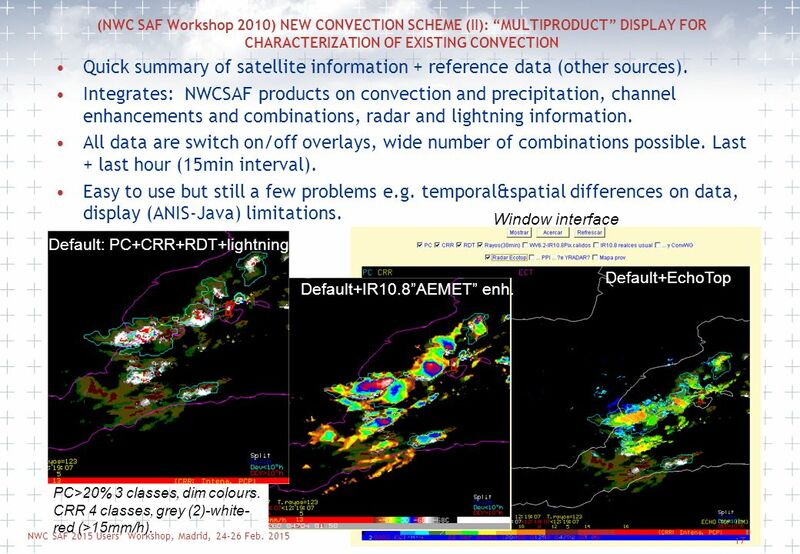 17 NWC SAF 2015 Users’ Workshop, Madrid, 24-26 Feb. 2015www.aemet.es 17 www.aemet.es 17 (NWC SAF Workshop 2010) NEW CONVECTION SCHEME (II): “MULTIPRODUCT” DISPLAY FOR CHARACTERIZATION OF EXISTING CONVECTION Quick summary of satellite information + reference data (other sources). 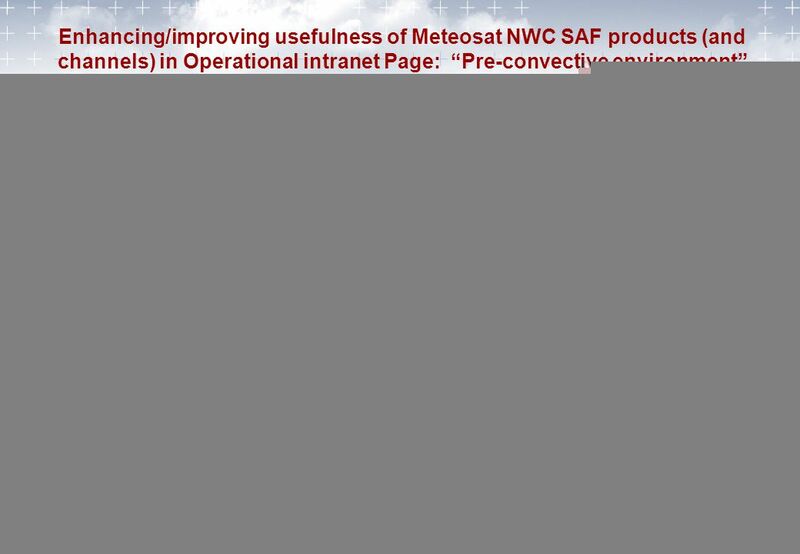 Integrates: NWCSAF products on convection and precipitation, channel enhancements and combinations, radar and lightning information. All data are switch on/off overlays, wide number of combinations possible. Last + last hour (15min interval). Easy to use but still a few problems e.g. temporal&spatial differences on data, display (ANIS-Java) limitations. Default: PC+CRR+RDT+lightning Default+IR10.8”AEMET” enh. Default+EchoTop Window interface PC>20% 3 classes, dim colours. CRR 4 classes, grey (2)-white- red (>15mm/h). 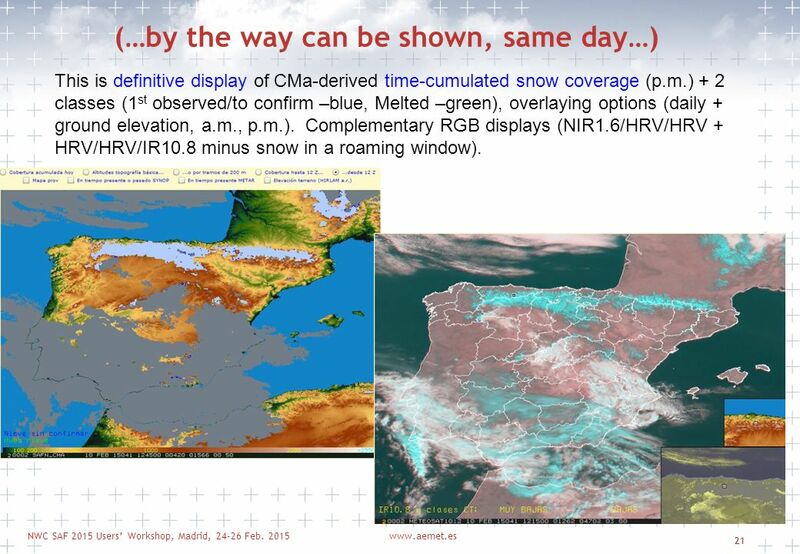 21 NWC SAF 2015 Users’ Workshop, Madrid, 24-26 Feb. 2015www.aemet.es 21 (…by the way can be shown, same day…) This is definitive display of CMa-derived time-cumulated snow coverage (p.m.) + 2 classes (1 st observed/to confirm –blue, Melted –green), overlaying options (daily + ground elevation, a.m., p.m.). Complementary RGB displays (NIR1.6/HRV/HRV + HRV/HRV/IR10.8 minus snow in a roaming window). 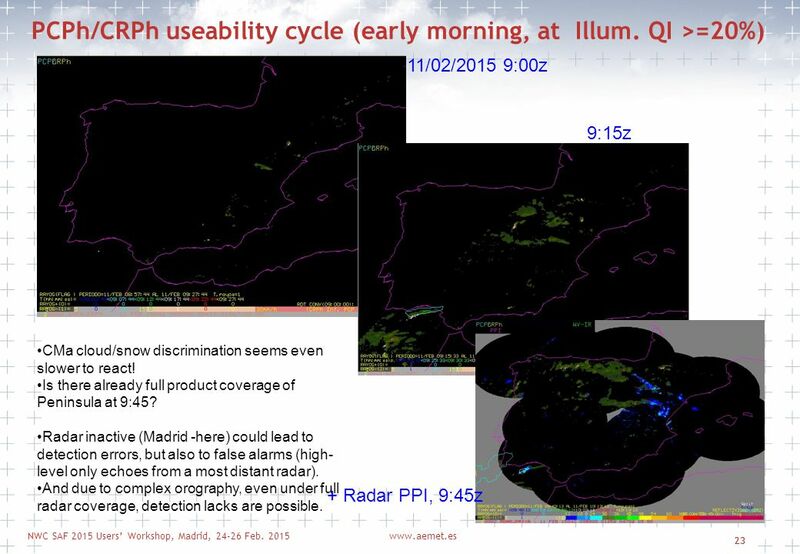 23 NWC SAF 2015 Users’ Workshop, Madrid, 24-26 Feb. 2015www.aemet.es 23 PCPh/CRPh useability cycle (early morning, at Illum. 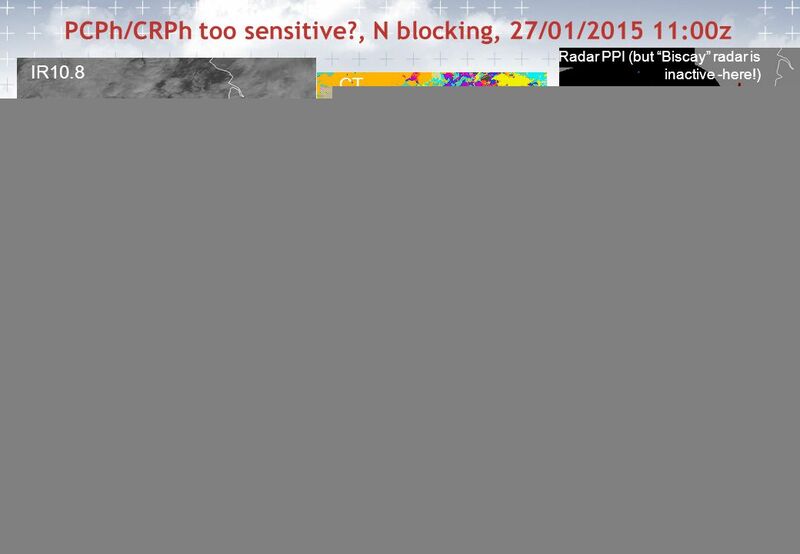 QI >=20%) 11/02/2015 9:00z 9:15z + Radar PPI, 9:45z CMa cloud/snow discrimination seems even slower to react! Is there already full product coverage of Peninsula at 9:45? Radar inactive (Madrid -here) could lead to detection errors, but also to false alarms (high- level only echoes from a most distant radar). And due to complex orography, even under full radar coverage, detection lacks are possible. 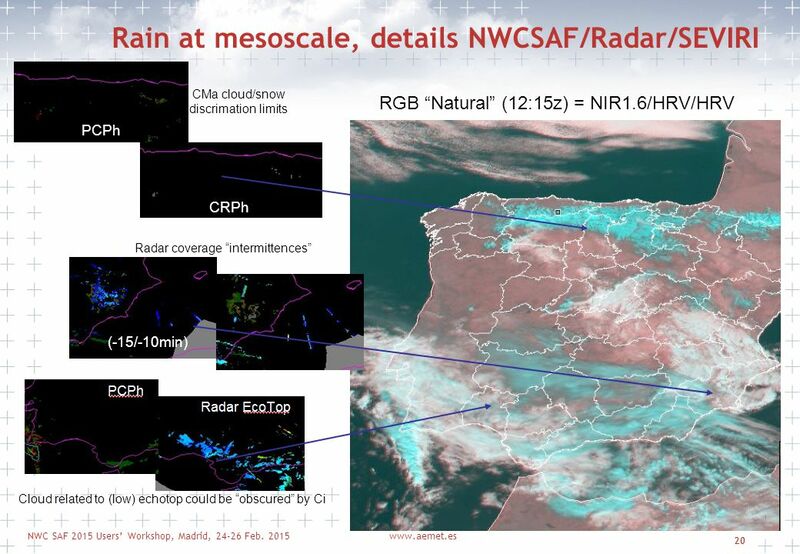 26 NWC SAF 2015 Users’ Workshop, Madrid, 24-26 Feb. 2015www.aemet.es 26 Value-added of Water Phase as compared to basic CT The interest is for low, MID (yellow) and high opaque cloudiness. Extense cloudiness (icing) Convection at different stages At central hours of the day, (almost) all well identified (= not broken) cloudiness is classified. 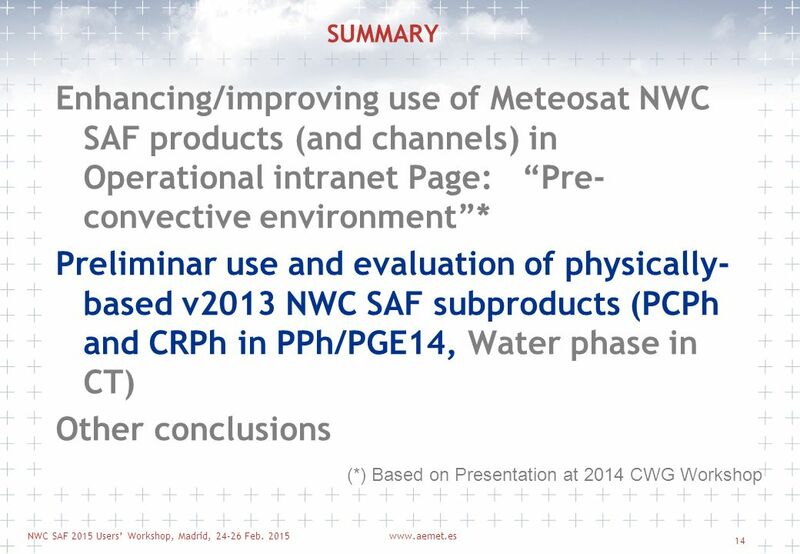 Download ppt "Recent experience on use of NWC SAF for operational nowcasting purposes at AEMET(Spain) José Miguel Fernández-Serdán ATAP (Forecasting Techniques and Applications." Potential future work on NWFS in Southern Appalachians Define categories for pattern recognition, determine if there are important differences in resultant. CDOP NWC SAF Workshop on Physical Retrieval Gabriela Cuevas Tascón, INM (Spain) November, 28th CDOP NWCSAF Workshop on Physical Retrieval. 1 Workshop on Physical Retrieval of Clear Air Parameters from SEVIRI SAF NWC Requirements November 2007 P. Fernández. Precipitation Products PPS Anke Thoss, SMHI User Workshop, February 2015, Madrid. 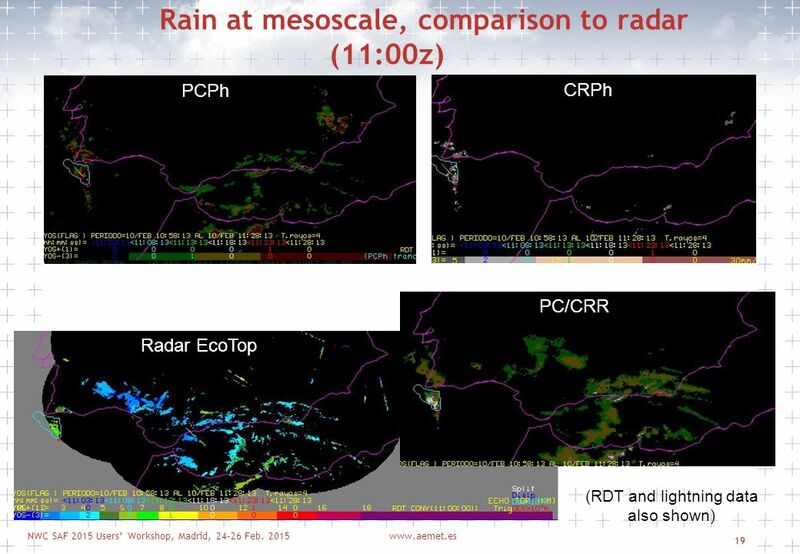 Calibration of GOES-R ABI cloud products and TRMM/GPM observations to ground-based radar rainfall estimates for the MRMS system – Status and future plans. 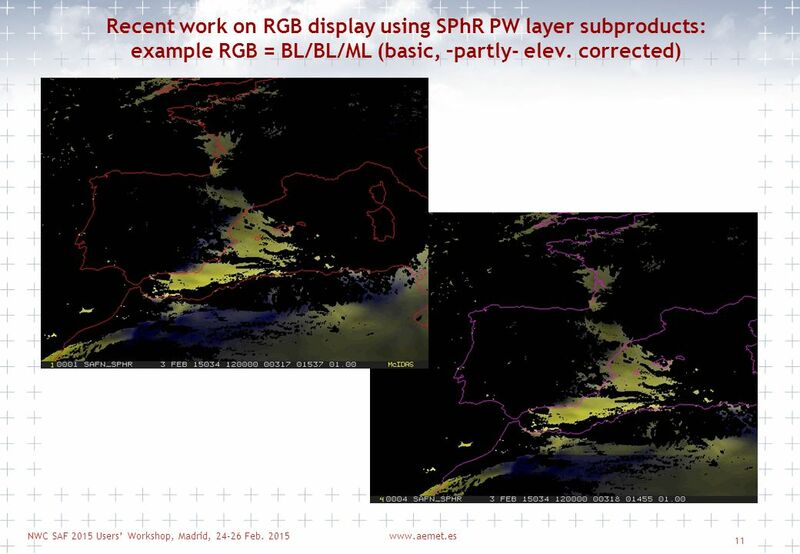 Improved Automated Cloud Classification and Cloud Property Continuity Studies for the Visible/Infrared Imager/Radiometer Suite (VIIRS) Michael J. Pavolonis. 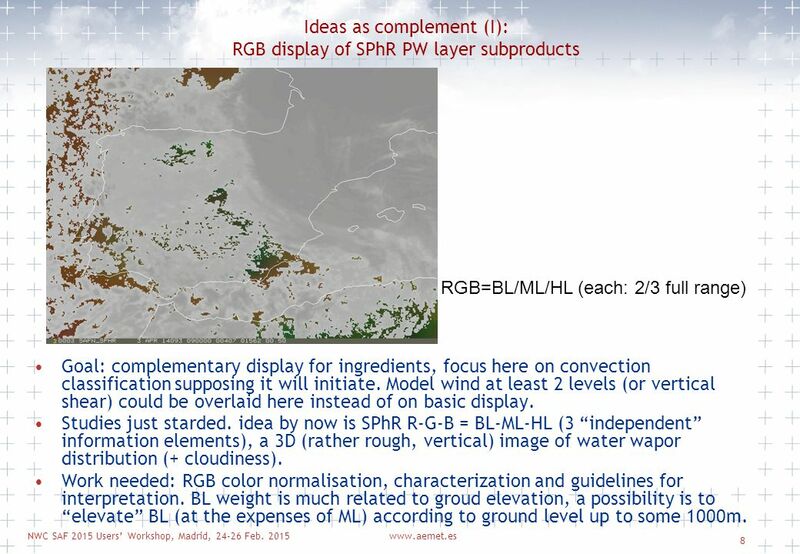 HansPeter Roesli, IntroRGB / 1 Introduction to RGB image composites HansPeter Roesli MeteoSwiss Locarno. © CNMCA Cap. Davide MELFI Italian Air Force Meteorological Service CNMCA An Italian tool for convection: NEFODINA Session 4 of Convection Week 2011, 6-9. New Product to Help Forecast Convective Initiation in the 1-6 Hour Time Frame Meeting September 12, 2007. 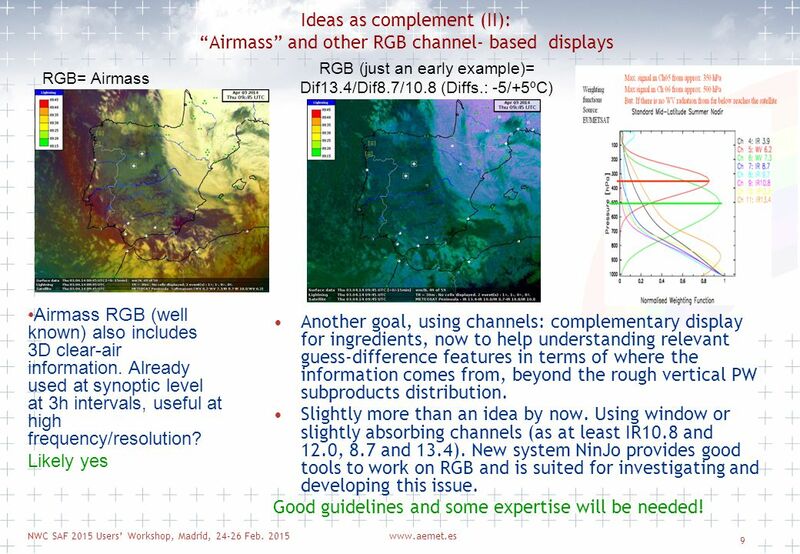 APPLICATIONS OF METEOSAT SECOND GENERATION (MSG) RGB COMPOSITES WITH CHANNEL 12 AND THEIR INTERPRETATION. 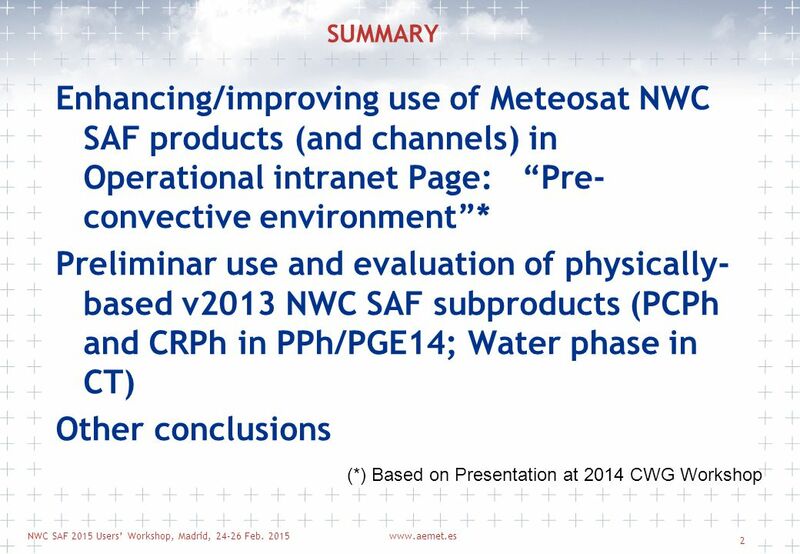 Convection Products NWC SAF 2015 Users’ Workshop February Madrid AEMET HQ, Madrid (Spain) Jean-Marc Moisselin, Frédéric Autones Météo-France. 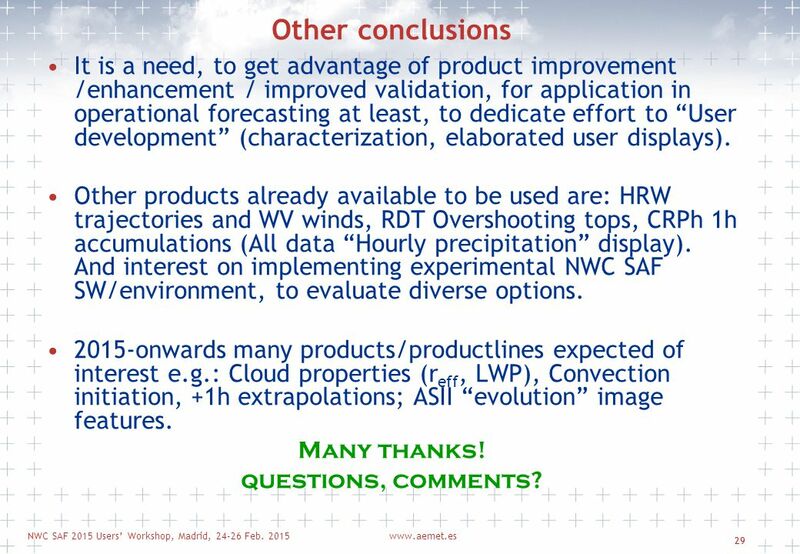 1 The EXIM (Extrapolated Imagery) products Alexander Jann ZAMG, Vienna, Austria NWCSAF User Workshop, February 2015, AEMET HQ, Madrid, Spain. Clear air echoes (few small insects) -12 dBZ. Echoes in clear air from insects Common is summer. Watch for echoes to expand area as sun sets and insects. 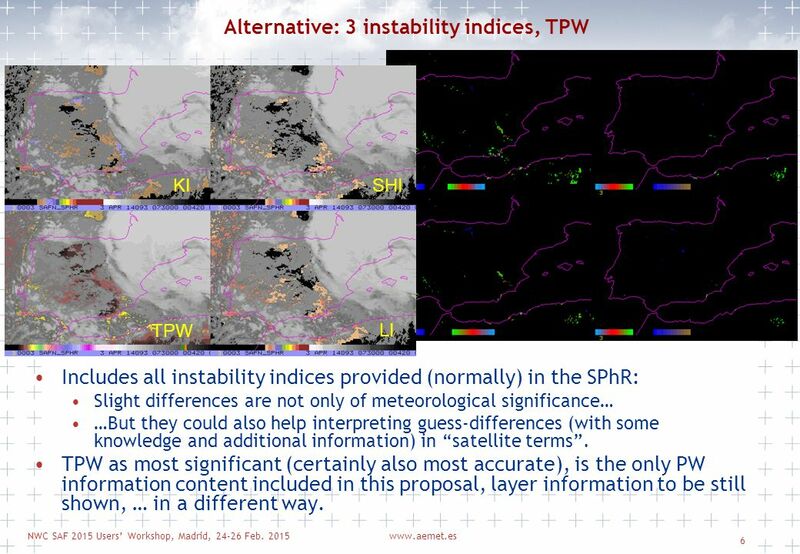 Convective Initiation Studies at UW-CIMSS K. Bedka (SSAI/NASA LaRC), W. Feltz (UW-CIMSS), J. Sieglaff (UW-CIMSS), L. Cronce (UW-CIMSS) Objectives Develop. 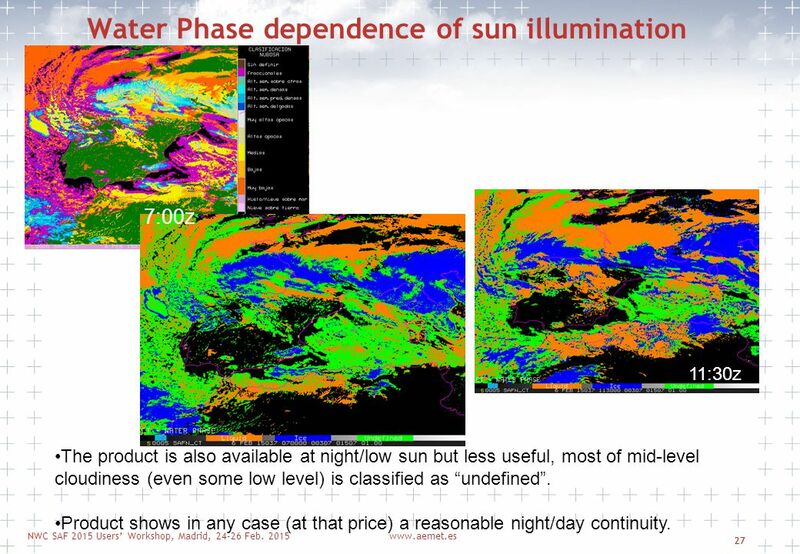 Hyperspectral Data Applications: Convection & Turbulence Overview: Application Research for MURI Atmospheric Boundary Layer Turbulence Convective Initiation.